Have the Conservatives Shifted on Home Education? You can read the 7 minute discussion in full here in Hansard. I intended highlighting this and the connection with OFSTED’s lobbying for the regulation of Home Education initiated by its recently retired chief Sir Michael Wilshaw. He had previously linked “unregistered schools” to home education. His attitude to HE made me wonder if he saw himself as the heir to Graham Badman, and his failed attempt to regulate home education. I wrote about this at the time here, here and here. Just before his retirement Wilshaw made a final effort to drag home education into the “illegal schools” debate. The BBC allowed him to conclude an interview with an unchallenged diatribe on the evils of home education. You can listen to an extract from the interview here or in full here (both on the BBC’s website). Baroness Deech did not seem to want his campaign to lose momentum after his retirement. I first noticed Baroness Deech when she supported Badman’s proposed changes included in the Children’s Schools and Families Bill introduced by Ed Balls. I remember her from when the Second Reading of CSF Bill was debated in the House of Lords on 8 March, 2010. At the time I commented on that debate here. Another noble lord who supported Badman on that occasion was Clive Soley. Make provision for local authorities to monitor the educational, physical and emotional development of children receiving elective home education; and for connected purposes. (1) Local authorities have a duty to monitor the educational, physical and emotional development of children receiving elective home education in their area. (2) A parent of a child receiving elective home education must register the child as such with their local authority. (3) Local authorities must assess annually each child receiving elective home education in their area (hereafter referred to as “the assessment”). (6) A parent of a child receiving elective home education must provide information relevant to the assessment to their local authority when requested. (8) A statutory instrument containing regulations under this section is subject to annulment in pursuance of a resolution of either House of Parliament. “Badman rides again!” is the only way to describe this bill. Let me state again that I do not think this Bill has any real chance of becoming law, but it is yet another drip in the constant flow of drops from those seeking to nationalise other people’s children for their own ends. All this is being done in the name of safeguarding and more recently security, i.e. the latter to prevent “extremism”, though n0-one to date has given a clear definition of what that means, other than anything contrary to David Cameron’s ‘British Values’. We would therefore be grateful if you could ask the Secretary of State for Education what the Government’s response is to the proposals contained in this new Bill. Please could you also ask if there has been any change in the Government’s views on home education since the start of 2016. We would appreciate it if she could confirm that children’s education will remain the responsibility of their parents throughout the life of this Parliament. 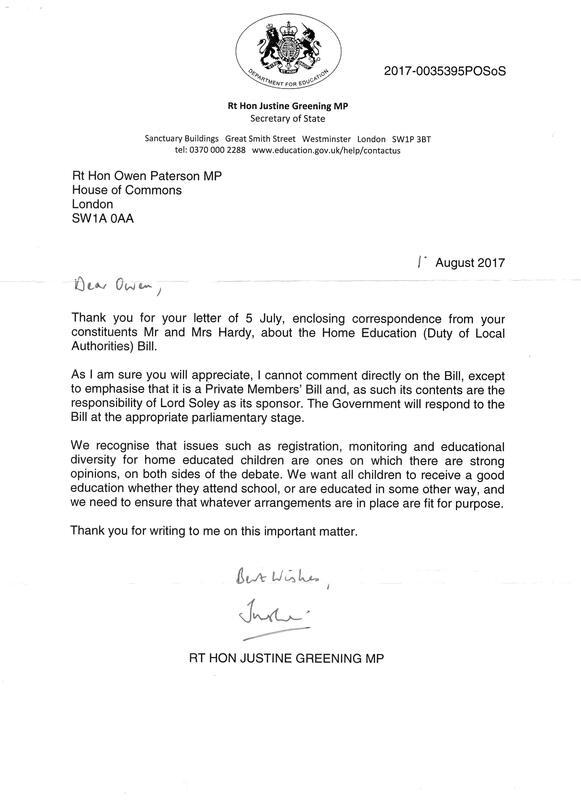 Thank you for your letter of 5 July, enclosing correspondence from your constituents Mr and Mrs Hardy, about the Home Education (Duty of Local Authorities) Bill. As I am sure you will appreciate, I cannot comment directly on the Bill, except to emphasise that it is a Private Members’ Bill and, as such its contents are the responsibility of Lord Soley as its sponsor. The Government will respond to the Bill at the appropriate parliamentary stage. We recognise that issues such as registration, monitoring and educational diversity for home educated children are ones on which there are strong opinions, on both sides of the debate. We want all children to receive a good education whether they attend school, or are educated in some other way, and we need to ensure that whatever arrangements are in place are fit for purpose. Thank you for writing to me on this important matter. It may be my suspicious mind, but it seems to me that that was a far clearer response that Justine Greening was able to give us earlier this month. Gone is the “respect for the right for parents to educate their children at home” and it has been replaced with the “need to ensure that whatever arrangements are in place are fit for purpose”. [Emphasis mine of course.] That to me suggests a shift in the Conservatives’ stand on home education. Together with the Liberal Democrats, they stood firm in 2010 against the Balls and Badman attempt to regulate (control) who can home educate and what they should teach. Now, following persistent erosion from certain educationalists and their political allies, I believe their resolve is wearing thin, and we are slowly moving closer to another significant attempt to change the law on home education in England. You may not think that the current Government will u-turn on this matter, but please remember that in the last 7 years the Conservative Party has made some very significant changes of direction on a variety of issues. Even if the law remains unchanged for the life of this Parliament, who knows what will happen when Labour regain power, as they almost certainly will one day, be that under Corbyn or one of his successors. Badman came out of the blue, and there was great relief when his proposals went down the plughole in the pre-election ‘Wash-up”. However, since then there has been a significant softening up of politicians by repeated cries of “Wolf!” in regard to home education. At all levels of politics the message that home education is “dangerous” is getting across! From personal contact we know that “safeguarding” is now a major worry for local councillors. The home educating community need to remain on the alert and do all they can to promote the positive face of their chosen life-style. Why not tell our political representatives how well our children do when they get out into the big wide-world? Early in this post I linked to an article which asked if there were alarm bells sounding for home educators? That author responded to Lord Soley’s bill with a change of tone. You can read their comments on it here: Persistent Alarm Bells for Home Educators. This entry was posted on 17/08/2017 at 4:51 pm and is filed under Home Education UK. You can subscribe via RSS 2.0 feed to this post's comments. Responses are currently closed, but you can comment below, or link to this permanent URL from your own site.